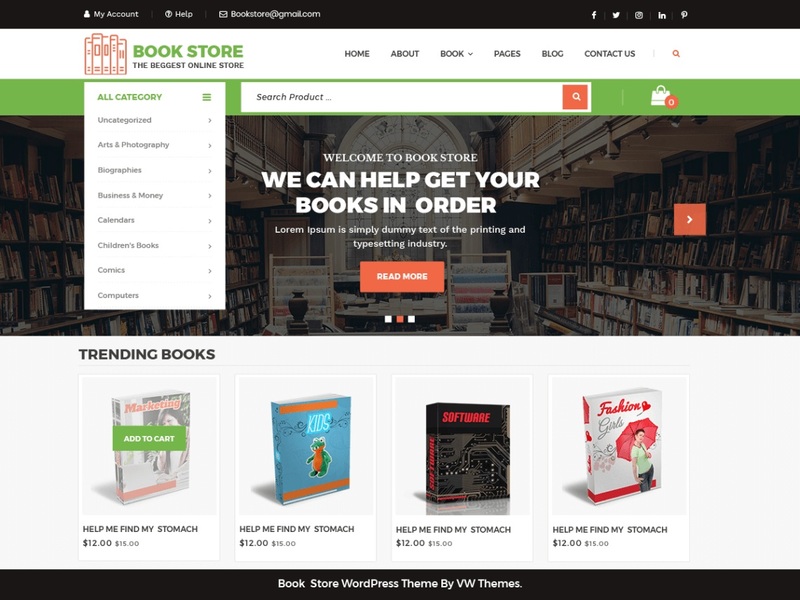 VW Book store is a feature-rich, flexible, robust and reliable WordPress theme for bookstores, eBook sites, writers, magazines, journalists, editors, authors, publishers, and online booksellers. The theme can very well serve libraries, reading clubs, online movie, music, and game selling sites. Built on Bootstrap framework, it is extremely easy to use. It is readily responsive, cross-browser compatible and translation ready. Its user-friendly interface of both frontend and backend will give a great experience to both your customers and you. It has multiple options to change the layout of the website. Banners and sliders are provided to further enhance its look. With a great scope of customization, you can change its color, background, images and several other elements. The VW Book Store theme is sure to give you good SEO results. It is lightweight leading to speedy loading. With social media icons, your content, posts, and website can be shared on various networking sites. These icons can also be used to let users follow you there. This bookstore theme can handle large traffic without hampering its functionality. It is purposefully made clean and secure resulting in a bug-free site. Use this theme to establish an online book hub for reading and literature lovers.